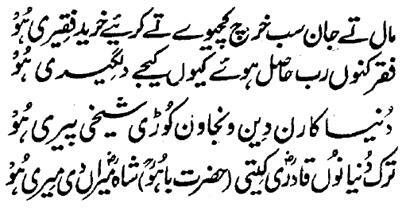 Hazrat Sultan Bahu Rahmatu-Allahe Ta-aala Alaihe says that 'Faqar should be chosen after spending and sacrificing the wealth and soul in the course of Allah Almighty. Moreover, when the Sustainer is found through the Tark and Faqar, then why should the Seeker displease Him. Those people, who accumulate wealth in the garb of Deen (Doctrine of Faith), all their show of being Pir and Sheik is gimmick, wiles and falsity. Tark of the Dunya (World) is the job of Qadiri as the Sufi Order of Hazrat Mahboob e Subhani, Qutab e Rabbani, Ghaus e Samadani Hazrat Shaikh Muhyiddeen Sayyed Abdul-Qadir-Jelaani (Qaddas-Allahu Sirru-hul Aziz ) is the highest one and the superior one.